Pattern imprinted concrete is perfect for any commercial premises. Known for its high quality, durability and low maintenance not only will it help your premises look good its long lasting. We’ve worked with numerous commercial clients over the years and our professional team will help you pick the right solution for your business. 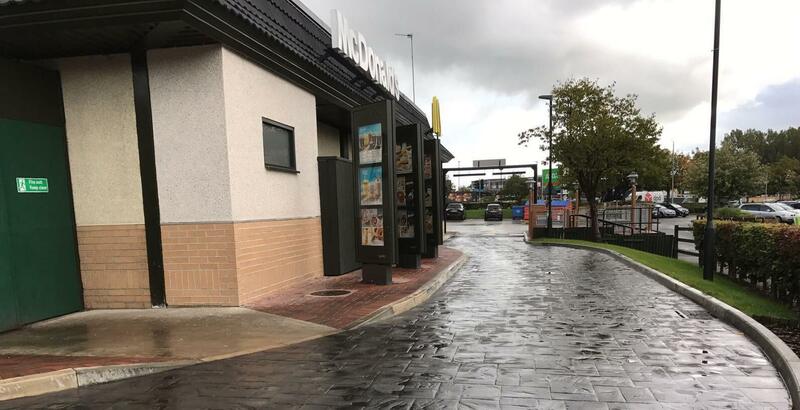 Amongst our many projects we have paved drive-thru lanes for McDonalds and KFC recently which you can see in the video below. During the design process we will work with your team and/or contractors, helping plan timeframes, schedules and design ensuring a stress free installation. All our pattern imprinted concrete installations come with a 10 year guarantee so you can rest assured that you’re getting a professional installation. For your commercial imprinted concrete call our expert team today.